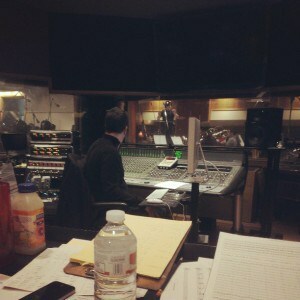 My view from the desk in the control room at Chicago Recording Company. In April of 2013 I had the honor of spending the day at Chicago Recording Company with composer/producer Scott Lamps, a 40-piece orchestra, an adult chorus, and the Chicago Children’s Choir. We recorded twenty pieces to serve as the score of Shedd Aquarium’s new and highly popular aquatic show, One World. My role was as music director and associate producer of the overall recording session, as well as coordinator of all the choral pieces. I selected the voices for the adult choir, coordinated and rehearsed the Children’s Choir, and conducted both groups in the recording. The One World show is a beautiful, moving experience that shows the interconnection of all life. I’m incredibly proud to have been a part of bringing it to life! Check out some of the audio and video excerpts below. A touching moment between trainer and Beluga whale, underscored by moving orchestral music with vocals by the Chicago Children’s Choir. Hear the studio recording or see video in the context of the show below. The show’s captivating opening sequence with moving video, dramatic lighting, and of course the Pacific white-sided dolphins! Hear the studio recording or see video in context of the show below.